It’s so true. My kids, ages 2 and 7, are drawn to water like magnets. They love everything from stomping around in mud puddles (preferably while it’s still raining), to splashing (me) in the pool, and jumping through waves at the beach. They even like bath time, on occasion. But neither of my kids can swim. Neither of them could save themselves if I looked away to check my phone or speak to a friend and they slipped into the water at that exact moment. It’s a horrible thing to think about – one of those things that keeps us parents up at night. But you have to think about it in order to try your absolute best to prevent it. On average, 29 children in North Carolina die every year from drowning. Drowning is the leading cause of accidental death in children under the age of 5 in America, and the second leading cause of death for kids ages 5-14. And it’s preventable, simply by teaching children the skills they need to be safe in and around the water. 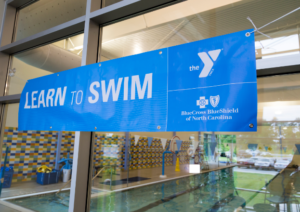 That’s why the YMCA and Blue Cross and Blue Shield of North Carolina came together to offer the Learn to Swim program in eight North Carolina counties, targeting second graders from Title 1 schools who might not otherwise have access to water safety courses. 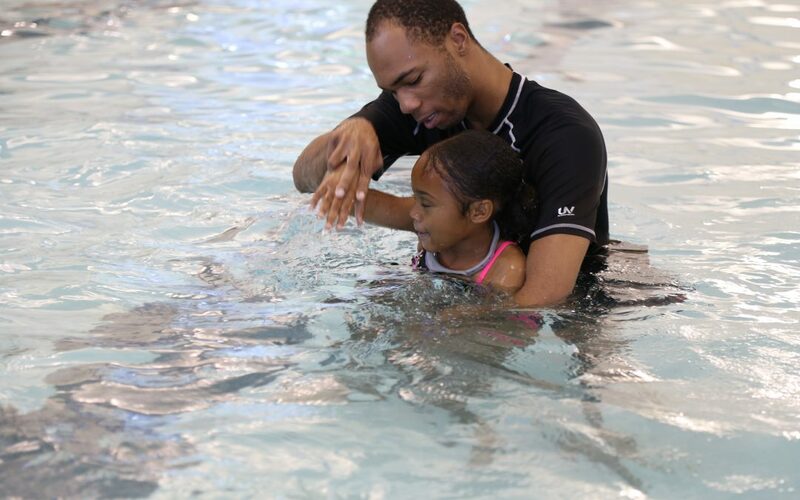 She and several other instructors were teaching kids from Simkins Elementary School – they were adorable and happy 8-year-olds, having fun learning to swim at the Hayes-Taylor Memorial YMCA in Greensboro. The program is also using technology to teach students to swim. Classes will begin using SEAL Innovation’s SwimSafe, a wearable device that sends off a signal if a child is in trouble in the water. I spoke with Dr. Graham Snyder, a Raleigh-based emergency room physician, and inventor of the SwimSafe device. I asked him to give me his top five tips for keeping my kids – and yours – safe this summer. He’s passionate about drowning prevention, and has made it his life’s work. Here’s what he told me. 1. Enroll your children in effective swim lessons. 2. Make sure there is a designated adult watching. Don’t make any assumptions about who is watching the children in the water. If you are busy at the grill, make sure someone else has verbally agreed to watch the kids in the pool. And make sure they are really paying attention, and not just sitting by the pool checking Facebook. Bonus points for knowing CPR, in case of an emergency. Treat the duty as you would being a designated driver, meaning no alcohol. 3. Create a safe pool environment. This means there should be a clear and unobstructed view of the bottom of the water. This is why you should never swim in the rain – the drops of “water on water” obstruct the view to the bottom, and make it unsafe for swimming. Ditto on any debris floating in the pool, like you sometimes see after a storm. Snyder laughed and insisted this wasn’t a shameless plug for his company, SEAL Innovation. There is technology available to help keep kids safe in water, so use it, if you have access to it. It could save a life. There’s a lot out there – including alarms that indicate when a home’s pool gate has opened. 5. Learn to swim yourself. This is perhaps the most important. Dr. Snyder recalls the “unbearable heartbreak” he’s seen in the ER, when parents tried to rescue their children in the water – but couldn’t, because they weren’t able to swim themselves. Take Maticia Sims’ cue, and learn to swim yourself. My oldest child, who will be in second grade soon, is almost a swimmer – he has taken swim lessons every summer for a few years, and I signed him up for a swim team this summer, not giving him the option to say no. My daughter is only a toddler, but it’s never too early for kids to learn a healthy respect for the water, so she’ll be taking lessons. And I just may take a few classes myself this summer. I’ve never mastered the freestyle stroke. And turning 40 is a great time for learning something new.